Playing to one of his strengths, Rybczynski (One Good Turn, 2000, etc.) takes a seemingly whimsical topic—the role of fashion in architecture—and lightly teases from it some discomfiting truths. Discomfiting, that is, for those architects—count them in legions—who bridle at the suggestion they might work in a style. But for Rybczynski it is plain as day that, of the three elements of architecture (function, durability, and delight), style has much to do with the last. 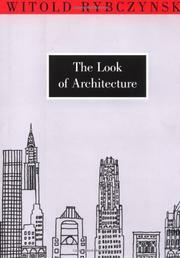 “Architectural style is the manner in which the architect communicates a particular kind of visual delight.” Furthermore, “if style is the language of architecture, fashion represents the wide—and swirling—cultural currents that shape and direct that language.” (Then, devilishly, if not convincingly, “If the relationship between dress and decor is intimate . . . there is no doubt that dress comes first.”) This short work is the result of a series of lectures delivered at the New York Public Library, and the author makes good use of the materials at hand—the library itself, the famous series of buildings along the 40th Street side, the infamous bunch along 42nd Street, and a few nearby structures—not only to display his sharp use of imagery (as in the “medieval verticality” of the RCA building or Raymond Hood’s black-and-gold Radiator Building glowing like hot coals) but to chart the rise and fall of styles—along with representative architects. Like his colleagues, Rybczynski doesn’t like confinement either, and he happily spins off to explore notions of absorbing and extending traditions, the importance of expressive detailing, and the folly of categorization (as architects “instinctively understand that the history of architecture—including the present—is a continuity rather than a series of episodes”). A good demonstration that clothes make the mansion, as well as the man.